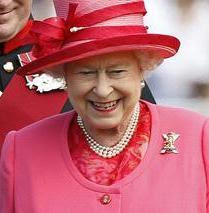 The Queen is Colonel-in-Chief of the Royal Regiment of Scotland, and of course she has a brooch form of their badge to wear on all appropriate occasions. 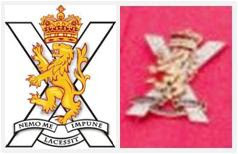 This one has plenty of Scottish symbolism: the lion is the Lion Rampant of the Royal Standard of Scotland, the X behind it is the Saltire of St. Andrew, and the banner below bears the regiment's motto, Nemo me impune lacessit ("No one provokes me with impunity" - also the motto of the Order of the Thistle). The badge is topped by a crown.